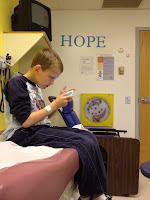 20120312 -Up and to Childern's Hospital with J for a checkup. They think he looks good :-) We then hit Subway for lunch and dropped off G's kindergarten paper work at his school, the whole time J was crouched down hiding in the car so he wouldn't have to to go to school ;-) Home and JG&I took a much needed nap. I woke up and was the only one left in the bed :-o It felt GOOD! Up did a little paper work and out for dinner, then all to Boy Scouts for a surprise honor party for Mike Sheldon for being the Scoutmaster for 30 years. He received a letter from the Mayor declaring today /Mike Sheldon Day' in Gahanna, many gifts and lots of great stories. In Mike's 30 years he graduate 58 boys to Eagle Scout. 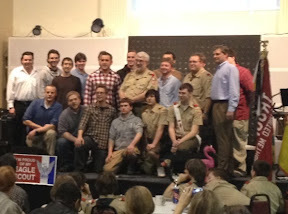 here are some of the Eagle Scouts with Mike. WOW! Home and boys to bed, off to Bible bangers.